Juliusz Słowacki (1809–1849) was one of the most famous Polish romantic poets. His earliest works, many of them created under influence of Byron and Shakespeare, were usually Oriental poems ( Arab ) or tragedies based on historic events ( Maria Stuart , Jan Bielecki ). 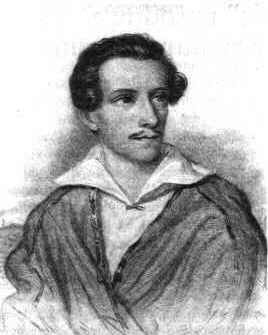 The breaking point for Słowacki's poetry was the November Insurrection (1830–31). In 1795, by the Third Partition, Poland's independence came to an end. The Kingdom of Poland created in 1815 by the Congress of Vienna was actually dependent on Russia and could not fulfill Polish people's hope for freedom. The insurrection of 1830 was to create an independent Polish country, but failed and caused severe repressions. The fight for independence became the main topic of Słowacki's works ( Hymn (Bogarodzico ...) , Oda do wolności , Kulik ). It also had a great influence of the poet's later life — like many others he had to go into exile to France, where he published some of his earlier works. After going to Geneva in 1832, he could not return to France, as the French government refused to let Polish political emigrants enter their country. The two volumes of poetry Słowacki had published in France did not find acceptance among Polish people, who expected only patriotic poems devoted to the independence movement. Thus, the third volume (published in 1833) included the insurrectionary poems as well as Lambro (based on the Greek resurrection against Turkey in 1821/22) and Godzina Myśli . In Geneva, Słowacki wrote Kordian (1833) — his first romantic drama dealing with moral and political problems of the generation which had lost the resurrection. A continuation of these problems were the dramas Balladyna (1834) and Horsztyński (1835). During his stay in Switzerland, he also wrote poems inspired by the alpine nature, including the original lyric Rozłączenie (1835). In 1836 Słowacki started off on a journey which led him over Italy, Greece, Egypt and Palestine. The remains of ancient cultures of the Mediterranean made this a trip in both space and time, resulting in poems expressing the poet's reflections about his nation ( Rozmowa z piramidami ) and analogies between the history of ancient Greece and Poland ( Grób Agamemnona ). During this trip, also many other works were written, among them Hymn (Smutno mi Boże ...) and Rzym . In Anhelli , the poet deals with the sufferings of oppressed Poles and presents a pessimistic and gloomy vision of his nations destiny. Impressions of the whole journey are described in Podróż do Ziemi Świętej z Neapolu (1836–39), of which Grób Agamemnona is a part. After coming back from the East, Słowacki stayed in Florence for two years before going to Paris, which was the center of Polish culture at that time. However, the poet did not find approval. His poetry, differing from the accepted model of Mickiewicz's poetry, instead of optimism brought negative and ironic opinions about the Polish exiles and their chances to win independence. In this conflict, only few recognized the originality of the "new" poet. Słowacki's answer was the drama Lilla Weneda , published in 1840, expressing the conviction that suffering and death may lead to a nation's revival. Beniowski , Słowacki's greatest digressive poem (published in 1841), dealt with traditional poetry, answered reproaches of the critics and introduced a completely new poetic workshop. Although it impressed the readers, Słowacki did not find followers — Mickiewicz's model of poetry stayed the popularly accepted way of writing. In 1842 Słowacki joined the organization of Andrzej Towiański — a religious and political group involving some important exiles (for example Mickiewicz), based on messianism and the faith in winning independence by the Poles in a short time. During this period, Słowacki created only few works, among them the dramas Ksiądz Marek and Sen Srebrny Salomei . At this time, the early ideas of Polish romantism started devaluating and loosing their previous value — this tendency was expressed in the tragicomedy Fantazy (written probably in 1844, published in 1866). In 1844 Słowacki wrote Genezis z Ducha , where he introduced his own philosophic idea (called thus the genesic idea) — the material world being an expression of the ever improving spirit capable	of progression into ever-new forms. Gradually, the poet gained more interest and gathered a group of the youngest exiles, their ambition becoming a patriotic organization capable of organizing an insurrection. In 1848, Słowacki managed to travel to the Prussian part of the former Polish country, meeting his relatives and trying to make his philosophic ideas more popular. After his return, those ideas resulted in untypical dramas ( Zawisza Czarny , Samuel Zborowski ), which explained Polish history by means of his genesic philosophy. During this time, the poet also wrote Król-Duch , an original genesic epopee revealing Poland's legendary past, but also showing in this context differing political ideas of Poles and the two different models of national poetry: Mickiewicz's and his own, the two poets being the two most perfect of the ancient spirits. Short before his death, the poet led important discussions with Norwid, one of Poland's most celebrated poets (besides Mickiewicz and Słowacki), described in Norwid's Czarne Kwiaty (1856), a book featuring his talks with famous people (e.g. Słowacki and Chopin). He died on April 3rd 1849. The poems I have included on this page are given only in the original Polish versions. Because of its specific character and sophistication, Słowacki's lyrics are very hard to translate and I wasn't able to find many translations of them (should you happen to know of any, let me know). So far, I know of translations of his larger works, including Anhelli , Ojciec zadżumionych ( Father of the plague-stricken ), W Szwajcarii (translated by Kenneth Mackenzie, published by Eyre & Spottiswoode in 1953) and other. The shorter works translated include Hymn (Smutno mi, Boże!...) (by Noel Clarke) as well as other poems in an anthology published by Ossolineum several years ago. There also is an anthology by Pietrkiewicz and Burns Singer. Z. W. Wolkowski's site includes translations of several of Słowacki's works into English and other languages. I wish to thank Nina Taylor for finding many of the translations listed above.